As a club we are dedicated to engaging with the community and we recognise that sport can play a key role in bringing a community together. We are be building partnerships & relationships with local schools and community organisations to offer sports coaching and other activities to children within school time, outside of school, and during school holidays. Any coaching is delivered by minimum FA level 2 coaches, who place child inclusion, enjoyment and development at the centre of their thinking. Due to expansion Gresley FC in the Community are recruiting Casual football Coaches to deliver football sessions within South Derbyshire. Casual coach positions will support our current community coaches, initially at our Sunday Coaching club (9am-10.30am), coaching children between 4-11 years old, with the view of further coaching as our scheme grows over the coming months. These roles could also lead to coaching places with our development squads as we look to expand. GFCITC is committed to coach development, with new coaches following our mentoring programme, with the potential of leading to paid opportunities. For further details please contact matt.toulson@gresleyfc.com. Gresley FC is now a Charter Standard club. The FA Charter Standard programme is a kitemark, which recognises and rewards high quality levels of provision in club and league football. The kitemark is awarded to clubs that are well run, sustainable, which place child protection, quality coaching and safety paramount. 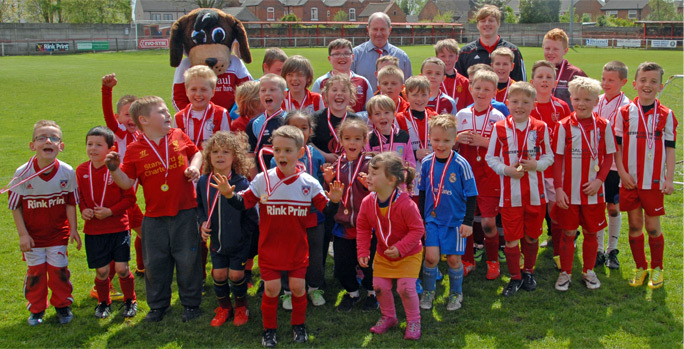 By achieving the FA Charter Standard Club Award, Gresley FC are demonstrating to all members of the public, sponsors, parents and the community, that we are a well-organised, safe club offering opportunities for all. Gresley FC in the Community now offer football coaching sessions for boys and girls aged 4-11 (School year Reception - Year 6) on Sunday mornings all year round at Eureka Primary School, Midway. Eureka Primary has kindly offered the school for our use, and sessions are open to all children, not just those who attend the school. The sessions will be 90 minutes long and will aim to build confidence and teach new skills to children of all abilities within a fun and safe environment. Each week there will be a different topic to develop skills through passing, dribbling, shooting and finishing etc. The sessions will cost just £4.50 each week and will be 9:00am - 10:30am. To book your child onto our new Sunday club or for more info contact matt.toulson@gresleyfc.com or on 07940 936 966. Gresley FC in the Community coaches are able to deliver a range of fun and exciting sessions within schools during curriculum time. The aim of this provision is to help develop children's skills and promote physical activity and healthy lifestyles through differentiated sessions which meet each child's individual needs. These sessions can also be used to engage with children who may not have the opportunity to take part in physical activity outside of school, whilst also improving the confidence of all participants taking part. The format used is dependent on the requirements of the school and can be linked to specific sessions to incorporate topics such as generic football, multi-skills, FUNdamentals and healthy lifestyles. The flexibility of curriculum coaching means that it can also be used to support and enhance existing school events such as sports days and activity weeks. Breakfast clubs are a great active way for children to start their day. Generally these session would start from 8:00am and will end prior to the start of the school. These can be multi skills sessions and are designed to prepare children for the day ahead. Lunch clubs are an ideal time for children to be able to get structured sessions in sport while still having enough freedom to use up all their spent up energy. Sessions are inclusive for all, and children are able to have their lunch then participate in their sports session with one of our coaches. These clubs also offer a great way to manage and engage children who find it difficult to interact and play with others freely in the playground. After School Clubs are a great way for a child to unwind with a fun, engaging, skill related activity after school. The sessions would usually run for an hour directly after the school day has finished, take place on the school grounds and run for the duration of a school half term. Session content focuses on progressive football specific topics or multi skills, with a lot of participant ownership and self learning, thinking for themselves, changing the practice and creativity, meaning everyone will see an improvement in their personal development. Gresley FC in the Community (GFCITC) have teamed up with South Derbyshire District Council’s Village Games scheme to support the new walking football sessions in Swadlincote. Devised back in 2011 by the Chesterfield FC Community Trust, walking football’s basic aim is to keep people aged over 50 involved with the sport. And now people living in South Derbyshire can get involved in walking football. Between 7:30pm and 8:30pm on Mondays, weekly walking football sessions are being held at Swadlincote’s Pingle School Sports Hall. Village games coordinator Lee English, approached Gresley FC to see how the club could help. Matt Toulson, Gresley FC’s Head of Community was more than happy to offer assistance to raise the profile and help arrange matches. The walking football programme links with GFCITC’s key strategy: To improve the lives of people within the local community by increasing participation in sport. This target has been set to be inclusive for all age groups within the community, and the walking football is a great way to get back into a sport that you may not have been able to play in recent years, or have never played before and are keen to give it a go. GFCITC have been able offer our support to the scheme by helping the players enter teams into future tournaments to represent the club, and Gresley FC Chairman Barry North has kindly donated an old first team kit for the players to use during tournaments. The walking football session costs £3 per week, with those planning to take part urged to wear comfortable clothes suitable for walking around. More information is available by contacting matt.toulson@gresleyfc.com or calling 07940 936 966. Why not let your child enjoy a memorable day at The Moat Ground as a Match Day Mascot? Each mascot will be looked after before the game by myself, and will meet the players before leading the team out onto the pitch prior to kick off. The mascot will also be there as the players go through their pre-match warm up, and after being announced to the crowd, they will have their photo taken with Elvis Gresley and the team captains. This is a great opportunity for any youngster to experience what it's like to be a first team player on a match day. There is no cost, other than your match ticket for the day, and we're happy to welcome individuals or junior teams between ages 5-11, so if you would like to know more please get in contact.